I am excited to be exhibiting recent work as part of the group show 'Arc Angle Plane Form' at Gallery 57 in Arundel and you are invited to the Preview Evening on Friday 1 March 6- 8 pm. Exhibition 2 March – 11 May. Sun and Bank Hols 12 – 5. I am showing the piece that featured in the Via Arts Prize shortlist exhibition last November in the Embassy of Brazil - The Tragic Destruction of Beauty and Reason (after Goya's Grande Hazana Con Muertos), in this exhibition that aims to raise funds to maintain the local canal. Please come visit my upcoming exhibition in January 2018 curated by Ian Boutell, Philip Cole, Stig Evans and myself. Seven contemporary abstract painters explore the possibilities inherent in space, colour, line and edge, and seek to develop a conversation around the language of paint. The exhibition presents a collection of paintings that have been developed through pre-meditated and choreographed processes; in developing the images, the artists favour intention over accident. Painting that is hard edged, non-figurative and abstract? Painting that is a complex and esoteric distillation of ideas? Summit is a another collaboration with Dawei Zhang and has been selected for the Royal West Academy Annual Open Exhibition, Bristol. This dynamic and varied exhibition invites painting, drawing, printmaking, photography, sculpture, illustration and mixed media submissions and is a showcase of some of the most exciting artists from across the country and beyond. All work is for sale, making the Annual Open a perfect opportunity to discover new artists or invest in well-known names. This year's of panel of selectors included Marie-Anne McQuay, Head of Programme at Bluecoat, Liverpool, writer, curator and lecturer James Russell and Joseph Clarke, director of Anima-Mundi, alongside RWA President Stewart Geddes and Academicians Stephen Jacobson, John Maine, Rachel Ara and Sara Dudman. Featured in the Queer Art(ists) Now exhibition taking place at Archive Gallery in Haggerston, London, between Thursday 12th – Sunday 15th October. Towner’s Open exhibition brings together the best artists from across the Sussex Region. Featuring painting, photography, drawing, film, ceramics and sculpture, Sussex Open 2017 offers a unique opportunity to view works by artists at every level of their career, from new talent to established figures. Artists who have previously exhibited work in our Open exhibition have gone on to be selected for John Moore’s Painting Prize, the Jerwood Drawing Prize, the BFI Film Festival in the experimental film category and have been shortlisted for the Mark Tanner Sculpture Prize. Just had a great weekend in Glasgow at the contemporary Art Fair. My collaborative work with Dawei Zhang that was featured in the Sussex Open in 2016 - Conversation in Grey, has found a lovely new home in Edinburgh. Come along to see recent work I've been doing in my studio. Preview evening drinks 6-9pm Friday 12 May. Then open 11-5 Saturday and Sunday. I will be exhibiting my painting New Horizons in Present Tense Exhibition. All welcome! The nature of exhibitions drawn from the diverse range of practices inherent within a studio organisation throws up several challenges – how to represent an idea or thematic that covers different areas of interest, artistic direction and media. 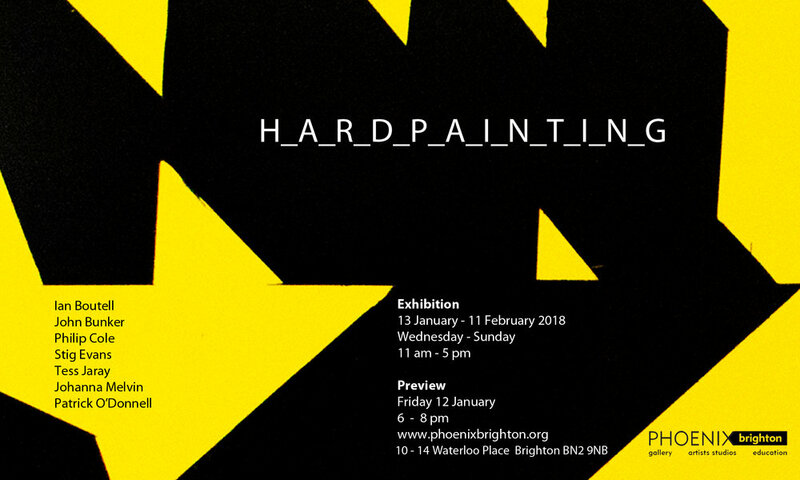 What is common to all in this particular exhibition is that it housed in the very particular space of the Phoenix Brighton gallery, where the exhibiting artists all work in the same building. Having trained as a sculptor, and now as a curator working with a wide variety of ‘exhibition spaces’ – from law firms to museums, historic properties to the more familiar white cube- I am interested in how we activate and operate within a space, through the art work, the curatorial premise and through the engagement of the audience. This exhibition, located in a site of multiple and varied artists’ practices, and drawn from them, considers how ideas can transcend a physical space, yet become grounded through different forms of making and display. At this highly charged moment of rapidly evolving political and economic change it seems a pertinent point to pause and bring into play an exploration of cultural and political space, opening up discussions around how individual lives and histories inform and shape the articulation of a practice. The title ‘Present Tense’ comments on these feelings of flux and uncertainty, whilst also offering a slice in time: a moment of shared connections and isolated thoughts. The exhibition encompasses drawings, on paper and on the wall; discreet surveillance manifesting as photographs and kinetic video; sculpture and paintings that speak to absence and presence, actions and affirmation. When selecting artists for the exhibition I had a deliberate intent to disrupt the physical space in some way through the siting and relationship between works. On entering the gallery works by Oliver Hein and the collaborative practice of Jon Carritt and Dan Palmer overtly and subtly reference the internal and external parameters of the building itself. Hein’s gently circling kinetic work asks the viewer to consider simultaneous realties. The projected video image of outside traffic co-exists within that moment of viewing the work itself, immediately displaced as we turn away. Reality shifts in that moment of change. Carrit and Palmer’s work also plays with that sense of displacement as they physically relocate the footprint of their studio to the gallery floor. Bringing both ‘making and display’ in to the equation they throw light on the nature of a studio practice and its conventional afterlife through exhibition. Bernard Mills’ autobiographical documentation of a creative working practice, installed as a beginning and ending marker in the exhibition takes us through a personal journey measured through time and location. “One needs privacy, peace and one’s own choice of audible company…”. Space is further disrupted by Caitlin Heffernan’s ‘Bird Boys’ who invade our sightlines and disturb our imaginations: dystopian, folkloric references merge with notions of innocence as static clothed mannequins are given new wings. Familiars give way to the familiar as Patrick O’Donnell’s ‘New Horizons 1 ’ shows us the way to the moon, albeit one altered through filters, painterly and perceptual. And mark-making takes another turn as Kiki Stickl’s eloquent transcriptions of remembered landscapes are made directly on the wall, dimensions constrained by the physicality of the movement. The discipline of producing works ‘Day by Day’, daily drawings later worked on in the studio, embassies the contradictions inherent in the production of the observed and remembered view. The back galleries host works by Emma Critchley and Rachel Cohen. Both artists explore the psychological and physical impact of our environments, and the human impact more broadly on the world around us. Intimate space and our perception of reality is upended as Critchley’s camera slowly pans around a domestic space, and then a ripple in time: a house is caught in the Somerset Floods, the vista reflected back at us in the movement of a droplet. The space becomes alien, the familiar no longer comfortable. We are reminded of the potential for destruction, the impossibility of holding back change, of being in control. As Rachel Cohen, un-witnessed, sweeps and clears a deserted ruin of a house we wonder at the pointlessness of it all, and yet it is mesmerizing, the sound soporific, as slowly but surely the nettles are cut down, the leaves removed and, for a moment at least, nature is held back, there is some space for control, until, as we imagine, the leaves fall again, the nettles grow and the clearing begins again. Nature again creates a focal point in Fergus Heron’s work based on the view from his studio window. Referencing and inspired by the earliest known surviving photograph made in a camera, (Joseph Nicéphore Niépce in 1826 or 1827) the view of Albion Street connects medium, technology and content to place and a very particular, politically charged, moment in time. These environmental and architectural references continue through Paul Morley’s slip cast porcelain ceramics where Brutalist buildings collude with Hitchcock’s Vertigo staircases. Ruth Rix’s painting takes us to the space of memory: a staircase signifying a past experience. Is her staircase a place of refuge or escape, a place to be hidden or discovered? As we grapple with discussions of refuge and refugees, identity and shared experience, these works ask us to consider the past as a place to reflect on. The exhibition begins and ends with works that consider our personal journeys and private space. Passages in time are amplified through Jane Fox’s ‘Mourning Stone’ drawings, made on site during a series of walks. The Stone of the title refers to a flint picked up on the day of her father’s death, now a signifier both of that specific moment and the present action, as the landscape and future unfolds before her. Wendy Pye’s evocative photographs of Beachy Head at twilight capture the ambivalent nature of a site notorious as a place of outstanding beauty and utter despair, in the tradition of the great romantics. Shot on film they reveal the photographer’s craft in creating a space for the viewer to consider a number of alternative readings. Phoenix Brighton is opposite St Peter's Church, close to Brighton Station (about a 10 minute walk) and on bus routes 5, 25, 28,29, 49 and 50. This was a bit of a stampede. Lots of interesting work. Especially loved the Van Gogh Portraits by Hughie O'Donaghue. Thanks again Celia for the invitation to exhibit. I was happy with having my own wall. Thank you to all those who have visited the show so far. It runs until 11th December. Please find attached invitation to my upcoming show - Retreating Light at Phoenix Brighton - Preview Friday 11 November 6pm. Pop in if you're passing. Also thrilled to be invited by Celia Imrie (yes really!) to exhibit 6 paintings (two examples below) at this year's Discerning Eye exhibition at the Mall Galleries. The 2016 Discerning Eye Exhibition will be open to the public on Thursday 17 November and runs until Sunday 27 November. Admission will be free and all works will be for sale. at Towner Gallery Eastbourne July 2016. Please visit soon for blog and news updates.